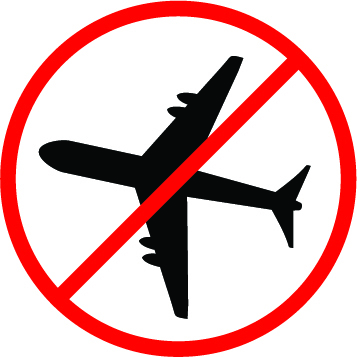 It’s always curious to see a “no fly” symbol on your newly purchased alcohol. The alcohol in question is Stroh 80, a 160 proof (80%) rum from Austria, which is about as not Caribbean as you can get. Having some Austrian ancestry, and an eternal curiosity about strange liquor, I had to get a bottle. Happily, the Pennsylvania state owned liquor shops also have an online variation that has all sorts of cool and odd things to drink. I’ve gotten crème de violette, Crème de Yvette, among other things from there. It’s very nice to have a chance to do so and not be shackled to the mundane tastes of the average person, drowned in a sea of Captain Morgan, Jack Daniels and sicky sweet flavored vodkas. The reason that you can’t take this stuff on airplanes is that it simply too flammable. While somewhat dangerous, this is what you want when you make the classic flaming cocktails, including many of the tiki ones. Bacardi 151 is something similar, though I find Stroh 80 to be much better tasting…. It still takes the top layer of your throat off when you drink it straight. Stroh 80 has a slightly sweet taste with a strong vanilla taste plus sweet spices. So far, I’ve made a classic Austrian cocktail called Jaegertee, which is basically hot strong black tea and various kinds of alcohol plus a little fruit juice. The Austrian National Tourist board has what I’m assuming is an authentic recipe on their website here. I did not have any plum brandy so I just added more spiced rum, e.g. Stroh. The wine I used was Cabernet Sauvignon from a box. The tea was Constant Comment from Bigelow, which had the added convenience of already being spiced. A pour of orange juice, a squirt of fresh lemon and there you go. And it will indeed make you feel warm and tipsy in short order. A spoonful of honey would also make a nice addition. While sipping my jaegertee and since I had a couple of days off from work, I also decided to do a bit of cooking. One of the small benefits of working in the meat department is that I can scoop up some more expensive meats when they are about to have their “sell by” date expire. It’s not much of a discount, but it does give us a chance to try a few new things. Yesterday evening, I made a magret duck breast, which is a half duck breast taken off the bone. You can order the same thing from D’Artagnan here. They also have instructions on how to cook it. Don’t be afraid to brown the skin well, until it is very dark brown. This will render the copious fat from the duck; I got a half cup of duck fat from this one half breast. We cooked it a little more than we probably should have but it was still delicious. To us, it tastes like a very good beef steak with a lovely layer of crisp poultry skin on top, the best of both worlds. 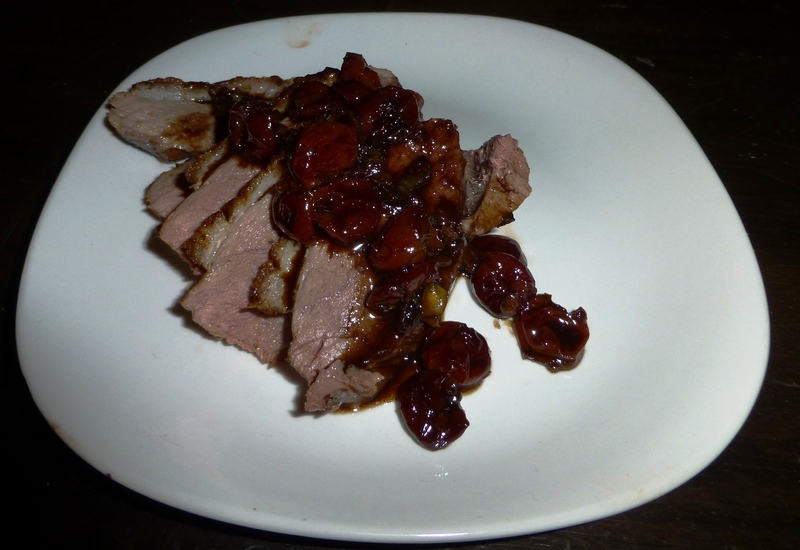 With this, I made a balsamic cherry reduction, recipe right here. Most excellent! We had this on its own, though we had planned on having asparagus with it. 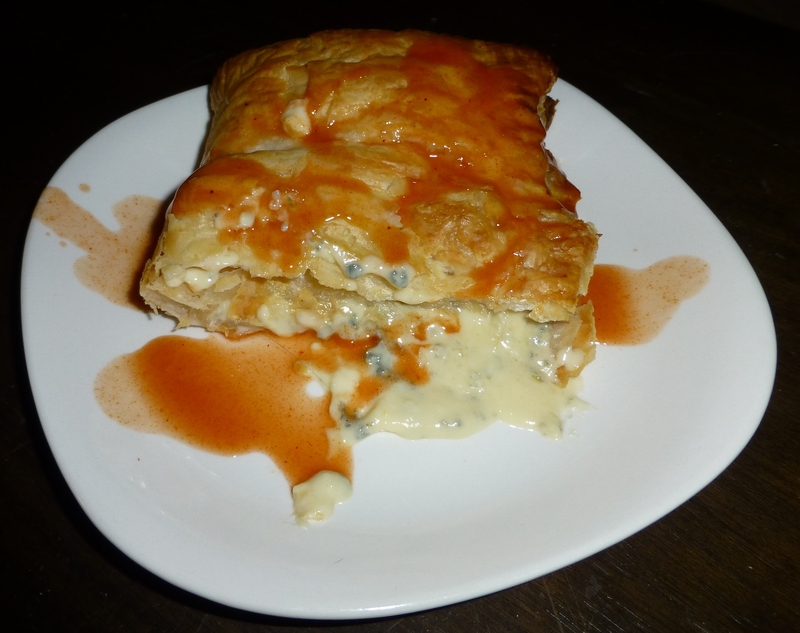 Our appetite was curtailed by an appetizer of a baked tart of blue cheese in puff pastry with hot pepper sauce drizzled over it. We had come upon this on our vacation to the Finger Lakes, at The Snug Harbor in Hammondsport. 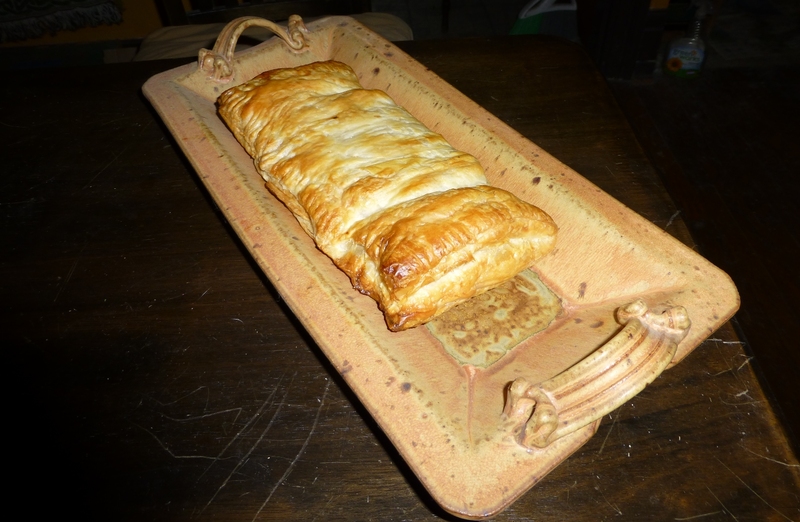 I recreated it with a sheet of frozen puff pastry and a slice of Danish blue cheese 5 inches on a side and a half inch thick (the original used gorgonzola dolce). Fold the pastry sheet in half, placing the cheese on one side. Moisten edges with milk and crimp with a fork to seal. Brush with milk to get a golden brown crust. To bake, follow the directions on the puff pastry box, in this case 430 degrees until golden brown. It took about 30 minutes. The blue cheese melted very nicely to fill the entire tart. A drizzle of hot pepper sauce, Franks Hot Cayenne, make it a nice riff on the classic buffalo hot wings. Next Post WHO NEEDS GOD?